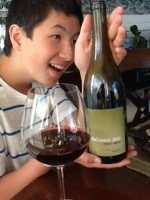 This Pinot Noir is a Sokol Blosser Winery entry level product from the Willamette Valley in Dundee, Oregon. As the name infers, it’s grown at 300m elevation. Medium garnet core moving to a thick and pale ruby rim, this wine shows sour cherry and ripe red raspberries with oak, earth, wet leaves and mushrooms. Elegant, balanced and solid, but overpriced at C$35. WSET Good; drink now and whenever you can. This entry was posted in Oregon, Pinot Noir, RED and tagged Delinea, oregon, pinot noir, red wine, sokol blosser, Willamette Valley. Bookmark the permalink.